It’s May 1910, and Halley’s Comet is due to pass thru the Earth’s atmosphere. And thirteen-year-old Hope McDaniels and her father are due to pass through their hometown of Chicago with their ragtag vaudeville troupe. Hope wants out of vaudeville, and longs for a “normal” life—or as normal as life can be without her mother, who died five years before. Hope sees an opportunity: She invents “anti-comet” pills to sell to the working-class customers desperate for protection. Soon, she’s joined by a fellow troupe member, young Buster Keaton, and the two of them start to make good money. And just when Hope thinks she has all the answers, she has to decide: What is family? Where is home? 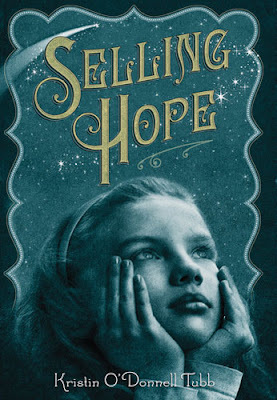 Not only is Hope's voice charming, quirky and mischievous, not only is her emotional arc captivating, and not only do I have a ginormous crush on Buster Keaton now - but Kristen O'Donnell Tubb could teach a class on how to write a historical novel that is both informative and entertaining. Her writing style is brisk and tight, and the story never slows. The reader is immediately emotionally invested in Hope and her destiny. Her father is painted perfectly, the bumbling magician with more on his mind than his daughter. The rest of the carnival participants are not caricatures, which would have been easy, but living, breathing, jump-off-the-page human beings. This is a rare breed of novel - it tugs at your emotions, it makes you think, and it exposes you to a segment of American history not usually explored in text books. A great resource for teachers, librarians and students, as well as just a darn good story. I expect SELLING HOPE has a future as a classic! I can't wait to read this, but I'm wondering what more I could possibly say about this book? You, LiLa, and Shannon have already done such beautiful jobs. You touch upon the one thing that always pulls me into the book--and that's brilliant characterization. Looking forward to reading this one. This sounds like one of those special books that sticks with you for a while. I'm going to have to read it! Thanks for the book review. Always looking for quirky, interesting reads like this. I don't read a lot of girl MC books, but I think I'd like this one. But I second everything you say. This is a FABULOUS book. Everyone needs to read it. It's one-of-a-kind! Such a great review! Can't wait to read this now! Need to run out and get this. Your review hits all my touch points--character arc, something to learn, brisk pace, and good writing. WIN!